Owens Funeral Home was originally founded in the early 1920's as the Roger C. Gipe Funeral Home; however it was operated as a typical storefront funeral parlor/furniture store combination. Mr. Gipe purchased the Chad Nicosan home and moved there in the late 1930's and began to operate from the Alexandria address as a true "funeral home." In 1950, Karl M. Kyle and Ralph Williams purchased the firm and operated it as Gipe, Williams, and Kyle Funeral Home. In 1957, Kyle bought out William's share and operated it under a new name, Karl M. Kyle Funeral Home. In 1960, Mr. Kyle added a substantial addition to the existing property which consisted of new chapel space, casket selection room, vault display room, preparation room, restrooms, and utility space. Also included at that time was a major redecorating of the existing facilities in a Williamsburg theme. 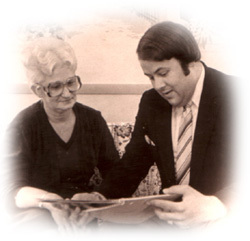 In 1978, the firm was purchased by Mike and Connie Owens. It was operated under the Kyle name until 1981 when it was changed to Kyle and Owens, and finally changed again to the present name in 1985. For more information about Mike and Connie Owens, please read the following article, which appeared in the Herald Bulletin in November 2001.